The key to a successful relationship with a pet rabbit is establishing a foundation of trust -- and lots of it. Many rabbits can be pretty meek critters, especially initially. If you put in the time and effort, however, you might just find yourself with an affectionate furry buddy a little down the line. The earlier you begin building trust, the better. It's no shock that food is the way to a bunny's heart, as humans are often that way, too. Begin the process of gaining your bunny's trust by keeping a wee portion of a nutritious bunny-safe snack tucked away in your hands -- think a fruit slice. Allow your bunny out of his enclosure and promptly go onto the ground, keeping your stomach against it. Then, simply wait. Encourage your inquisitive pal to come to you, but don't push the issue. Once your bunny is near you and starts smelling you, he'll soon discover that you're holding something yummy. He'll also familiarize himself with your personal scent -- a great bonding tool. Once he makes his way to the snack, keep it in your hand as he munches on it. Make a point of doing this on a daily basis. 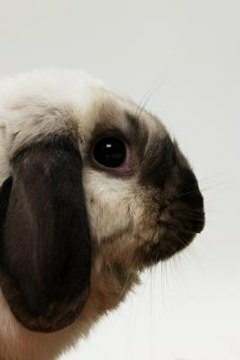 Encourage your bunny to think of you when he thinks of food -- a positive mental association. The way you talk to your bunny also might be effective for getting him to trust you. Always talk to him in a measured, serene and controlled voice -- not too loud, harsh or shrill. When you chat to him, avoid doing anything abruptly or quickly. Quickness can be extremely jarring and shocking to delicate rabbits. Restrict your bonding exercises with your bunny to isolated, silent environments. Whether you're getting your bunny used to your smell or simply talking to him, keep the atmosphere laid-back and low-traffic. Turn the television off. Close the door. Make sure no other pets are around to bother your interplay. As you progress in building trust with your rabbit, start to build a deeper bond by softly stroking his forehead. This usually feels good to bunnies, and as a result is a strong starting point in petting. Once you sense your bunny loosening up to the whole notion of touch, begin petting his back and holding him in a relaxed and low-key way. You can even try giving him an "Eskimo kiss" by pressing your nose lightly up against his. Remember, bunnies often find hands a lot more menacing than other body parts, such as faces. Smooth murmuring sounds often can be comforting to rabbits. If you're close to your rabbit, increase his relaxation level by murmuring faintly to him. Bunnies sometimes send messages to each other by murmuring amongst themselves, so this is familiar territory for the furry lagomorphs. Always hold your rabbit in high regard. Consider his feelings and needs. Never, ever run after him, no matter what. As prey creatures, all that does is terrify them. Also never be forceful with your bunny. Let him do things at his own comfy pace. If he squirms wildly when you try to pick him up, let him go. Not all rabbits are the biggest fans of being picked up, after all.